Members of the N.Y. National Guard CBRNE Enhanced Response Force Package conduct casualty search and extraction training at the NYS Office of Fire Prevention and Control’s Urban Search and Rescue Training site in November, 2007. The unit will train alongside New York City Firefighters and emergency responders May 3 as part of Operation Civil Support, a joint interagency emergency response training event at the FDNY training academy on Randall’s Island. U.S. Air Force photo by Master Sgt. Willie Gizara. NEW YORK -- New York National Guard Soldiers, Airman and volunteers of the New York Guard will mobilize and deploy from across the state this weekend to prepare the state’s military forces for Chemical, Biological, Radiological, Nuclear or High Explosive (CBRNE) incidents. The National Guard will train alongside the City of New York Fire Department (FDNY) at the fire training academy on Randall’s Island to strengthen the coordination, liaison, techniques and procedures for employing the New York National Guard’s premiere CBRNE response elements to assist civil authorities. The response training exercise, known as Operation Civil Support, prepares members of the New York National Guard to better support civilian authorities with hazardous material assessment, casualty extraction, decontamination and medical triage. The response exercise begins with an alert and mobilization of forces from Western and Central New York, the Capital Region, Hudson Valley and New York City. Staging at the National Guard’s training site at Camp Smith, near Peekskill, the response forces will be called to the training site as a supporting element to an FDNY response exercise. The mobilization of forces will include the airlift of engineer assets from Niagara Falls Air Reserve Station, the home of the Air National Guard’s 107th Airlift Wing to Stewart Air National Guard Base, home of the 105th Airlift Wing. The exercise occurs at the FDNY Fire Training Academy on Randall’s Island in New York City. The 27-acre waterfront facility has nine buildings including both classrooms and hands-on training with simulated fires and smoke structures. The training exercise at the FDNY training academy site will include a realistic scenario with simulated casualties, debris, and the challenges of a response in an urban area. The exercise provides members of the National Guard’s response teams the chance to learn from the FDNY and EMS members and their expertise in the core competencies of search and rescue, structural evacuation and CBRNE/HAZMAT life safety and mass decontamination. The training will involve two key elements of the National Guard’s homeland security response forces for CBRNE incidents. The New York National Guard currently maintains a full-time Civil Support Team (CST) whose 22 members are trained, certified and equipped to augment civil authorities to rapidly identify, assess and respond to homeland security Weapons of Mass Destruction (WMD) or hazardous materials (HAZMAT) events. The 2nd CST, based near Scotia, N.Y., originated in 2001 and an additional team, the 24th CST, is currently being organized at Fort Hamilton, N.Y. for future response roles. The team is further enhanced by a traditional National Guard CBRNE Enhanced Response Force Package (CERFP). 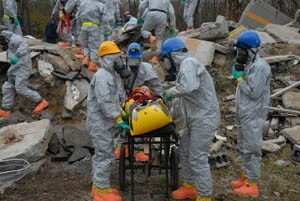 Its 300 Soldiers, Airmen and N.Y. Guard volunteers mobilize and deploy with equipment to provide emergency responders with additional CBRNE casualty extraction, decontamination and triage for the evacuation and initial treatment assessment of victims of a chemical, biological, radiological, nuclear, high explosive or other hazardous materials incident. The National Guard regularly trains these elements to support civil authorities and elements of the CST routinely perform homeland security missions in support of law enforcement officials throughout New York City during key events. Operation Civil Support will also train the National Guard standing homeland security task force for command and control of response forces. Task Force Empire Shield, the National Guard full-time security task force designated to support New York City will oversee the employment of the Guard’s CBRNE response forces, security elements, communications units, Army Aviation assets and logistics. The task force is based at Fort Hamilton in Brooklyn. The New York National Guard last trained for CBRNE response in November of 2007, utilizing New York State Office of Fire Prevention and Control’s Urban Search and Rescue training site in Albany. The Fire Department of New York City (FDNY) has the responsibility for protecting the citizens and property of New York City’s five boroughs from fires and fire hazards, providing emergency medical services, technical rescue as well as providing first response to biological, chemical and radioactive hazards. The FDNY is the largest municipal fire department in the world with approximately 11,400 uniformed officers and firefighters.